If you’ve mastered making New Zealand’s number one selling Riesling, it makes sense to challenge yourself, right? That’s why the Giesen winemaking team has created a limited release, Gemstone Riesling. Giesen has a quality Riesling pedigree. Founders Theo, Alex and Marcel Giesen drew upon their German heritage to create Estate Riesling which they have made since their first vintage in 1984. Giesen Estate Riesling has become a favourite with Kiwis. It has won five consecutive Gold Medals at the New World Wine Awards and multiple trophies, including most recently; Champion Riesling Trophy and Champion Open White Wine Trophy, at the Air New Zealand Wine Awards 2016. Nikolai says it’s the use of granite which makes Gemstone so special. Granite tanks are made from one giant slab of volcanic rock and the French have been fermenting in them for centuries. Mother nature threw in some challenges through the 2016/2017 growing season – a major earthquake, a cool, windy summer and some autumn rain. While this meant vintage 2017 delivered a smaller than predicted harvest, reduced fruit volume ensured a balanced crop. Riesling vines in the Giesen owned Eden Vineyard in the lower Waihopai Valley were intensely managed. The vines, with an average age of more than 20 years, were shoot and bunch thinned to maximise ripening and ensure pure, intense flavour. Fruit was hand harvested before being pressed as whole bunches. Free run juice was fermented in a combination of granite tanks, seasoned oak barrels and stainless. After fermentation, the wine was matured on light lees for five months. This special limited release Riesling really is a gemstone. 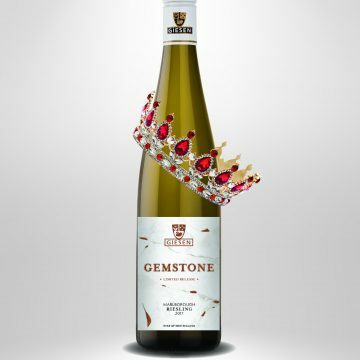 Just as mother earth creates gemstones, Giesen worked in harmony with the earth, growing full flavoured Riesling grapes which were fermented and matured in granite, creating a precious gem, Gemstone by Giesen. This wine is enticing and textural with notes of luscious citrus blossom and white florals. A beautiful flow and balance with subtle sweetness and hints of smokiness. Enticing, Heavenly, Unique. A unique Gemstone of a wine.